'Tis the Season for Giving - Why Not Volunteer? As Americans, we view the holiday season as a time for giving. For many people, giving means material gifts. But for many others, it's a time to give of themselves and their time, contributing to their communities and to those in need. Popular volunteering projects during the holiday season include helping at soup kitchens, donating items to the less fortunate and giving money to organizations including the Salvation Army, the Red Cross, UNICEF or local shelters. While there are many opportunities to give back in the United States, there are also thousands of opportunities to spread the joy and spirit of giving to other countries. Volunteering abroad is a great opportunity to break out of the traditional role of a tourist, learn something new about the world and yourself, and help those in developing countries who may be in great need. 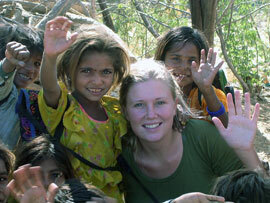 InterExchange Working Abroad works with respected volunteer organizations in India, Africa, Australia and South America, matching international volunteers with worthy projects, with start times throughout the year. Our programs include projects in community development, public health, wildlife conservation, social work and working with children. We also like to give back through our InterExchange Foundation where we provide financial assistance to talented young Americans so that they are able to discover the world and benefit from the unique and enriching insights one can only gain from living and working abroad. So, instead of asking for material gifts this holiday season, why not ask for the gift of travel to help you start on your volunteer abroad program? Help others, while making a real lasting change in yourself! Contact our team today to find out which volunteer project is the best match for you!